Quaaludes is one of a few bands in Montreal that for the most part defy classification. As a result, I’ve taken to referring to bands like them as “sad punk”. Their music is sad, aggressive, melodramatic and has an almost inexplicable math-rock influence. The sometimes awkward rhythmic choices add a layer of confusion and angst that fits well with the rest of the band’s overall sound. Their debut EP, This Is Your Future We’re Talking About, is short and consistent. Each of its five tracks rarely step outside of their relatively original sound, making its short running time somewhat of a relief. Its opening track, Mr.Transistor, starting with a driving pop-punk cadence matched with Jon Nudell’s rough voice, brings to mind the catchy dissonance of Hot Water Music. By the second verse the guitars get twinkly and endure merciless tapping, making it sound like two separate songs in one. The song slows into a grinding groove two minutes in and the tempo change is heralded by a harrowing series of shouts. This Is Why has a similarly aggressive tone, thanks in part to some vicious screams provided by guitarist Aaron Cohenca. The song is short and made sweet with a pretty intro. Antigua opens like an Explosions In the Sky or Mogwai track, gorgeous and instrumental. The inclusion of a trumpet gives this part of the song a soft and bright, almost jazzy, feel. The songs eventually switches gears to a sound that is more typical of the band and as a result, unfortunately erases the charm and relief of the intro’s standout quality. The song does have an interesting and emotional crescendo and the guitar riff it closes with is gorgeous. History is the EP’s most exciting and heaviest song. Opening with a deliciously distorted guitar riff and full of technically impressive drumming, this is my favorite song on This Is The Future We’re Talking About. Certain vocal effects and overdubs give the song an unexpected trippyness, a feeling you’d almost expect to experience more of when listening to a band called Quaaludes. The closing track, Ocean Bingo, has an anthemic feel often associated with sad-punk. Rallying cries that both celebrate and bemoan an emotional existence are a must for the folks who listen to and write music like this. The math-rock influences are minimal on this track and it sounds more like a cross between post-rock and punk. This Is Your Future We’re Talking About is good, but far from perfect. There’s little variation vocally and Jon’s unique style makes most of the lyrics undecipherable. They’ve developed a signature sound that doesn’t get tired by the end of the EP but it doesn’t hold up particularly well to repeated listens. 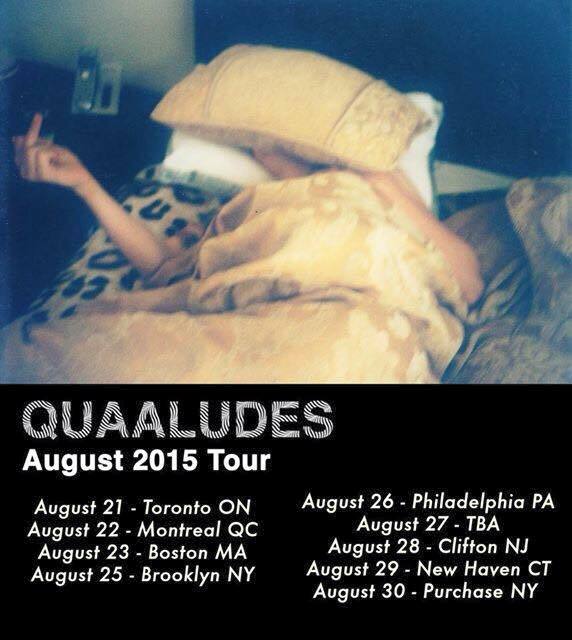 That being said, Quaaludes is a band I fell in love with in a live setting and thankfully, you can too! They’re going on tour and you can catch them here in Montreal on August 22.